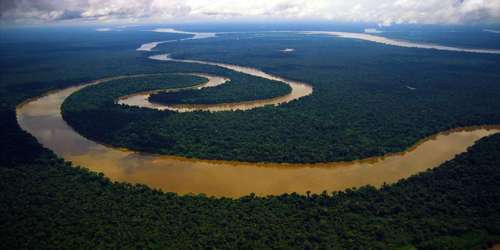 Nile River, the longest river in the world, called the father of African rivers. It rises south of the Equator and flows northward through northeastern Africa to drain into the Mediterranean Sea. The two major tributaries, commonly known as the White Nile and Blue Nile whose sources are Central and Eastern Africa respectively, marry at the heart of the Sudanese capital; Khartoum where the river begins its journey north, swimming through plains and valleys and birthing agricultural life in the desert plains of Egypt before dividing into the Mediterranean Sea. Lake Victoria, Africa’s biggest lake, is generally thought of as the source of the River Nile. On the northern edge of the lake, water pours over a waterfall, known as Ripon Falls, into a narrow opening which some people believe is the beginning of the River Nile. It has a length of about 4,258 miles (6,650 kilometres) and drains an area estimated at 1,293,000 square miles (3,349,000 square kilometres). Although it is generally associated with Egypt, only 22% of the Nile’s course runs through that country. 6853 km long, 3.9 km wide, 9.5 meter deep – on average – with a discharge rate of 99,940 cubic meters per second and the longest water course on earth, the Nile River is arguably the 9th wonder of the world. Its basin includes parts of Tanzania, Burundi, Rwanda, the Democratic Republic of the Congo, Kenya, Uganda, South Sudan, Ethiopia, Sudan, and the cultivated part of Egypt. Its most distant source is the Kagera River in Burundi. The River Nile flooded every year between June and September, in a season the Egyptians called akhet – the inundation. Melting snow and heavy summer rain in the Ethiopian Mountains sent a torrent of water causing the banks of the River Nile in Egypt to overflow on the flat desert land. The construction of the Aswan Dam in the 1960’s meant that from 1970 the annual flood was controlled. Hapi was the Nile god. Honouring a god was very important, so when a flood came the Egyptians would thank Hapi for bringing fertility to the land. The Nile was a mysterious god: sometimes beneficent, sometimes vengeful. Floods between June and September, the months of peak flow, could wipe out entire villages, drowning thousands of people. Floods also brought the brown silt that nourished the delta, one of the world’s most productive agricultural regions, feeding not only Egypt but many of its neighbors. Fertile Land: The most important thing the Nile provided to the Ancient Egyptians was fertile land. 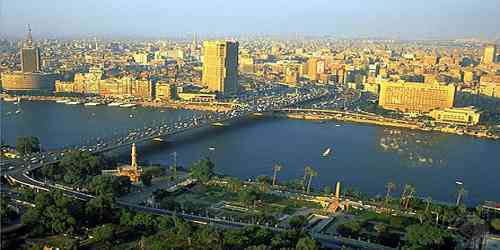 Most of Egypt is desert, but along the Nile River the soil is rich and good for growing crops. The three most important crops were wheat, flax, and papyrus. Flooding: Around September of each year the Nile would overflow its banks and flood the surrounding area. This sounds bad at first, but it was one of the most important events in the life of the Ancient Egyptians. The flood brought rich black soil and renewed the farmlands. 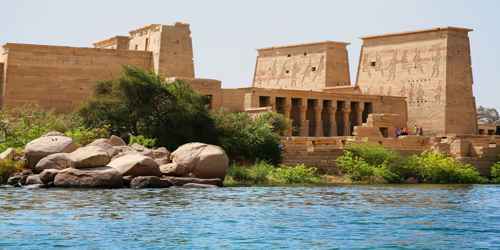 Building Material: The Nile River also provided a lot of building materials for the Ancient Egyptians. They used the mud from the riverbanks to make sundried bricks. These bricks were used in building homes, walls, and other buildings. The Egyptians also quarried limestone and sandstone from the hills along the side of the Nile. Transportation: Since most of the major cities of Ancient Egypt were built along the Nile River, the river could be used like a major highway throughout the Empire. Boats constantly traveled up and down the Nile carrying people and goods. The River Nile runs through Egypt, creating a fertile green valley across the dessert. The Nile flows south to north, beginning in the highlands of Ethiopia and Rwanda heading toward the Mediterranean Sea at Alexandria, Egypt. 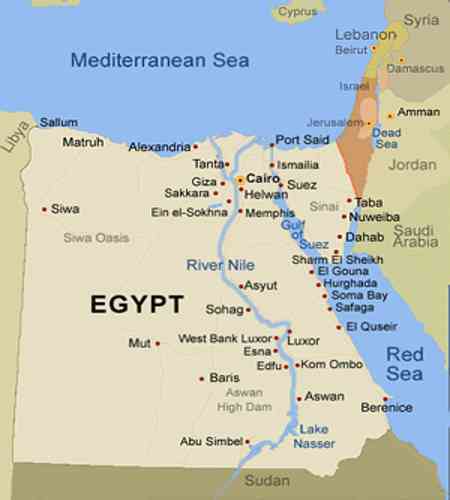 Around 5000 B.C., the first great Egyptian civilization was founded in the northern Nile Valley. The Egyptians came to rely heavily on the Nile and its annual summer floods for irrigation, agriculture and transportation. 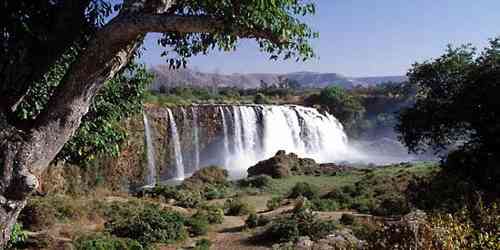 The River Nile is in the beautiful continent of Africa. It originates inside Burundi, south of the equator, and flows northward to northeastern Africa, eventually flowing through Egypt and then draining into the Mediterranean Sea.